This article is about the machine used to accumulate electrical charge on a metal globe. For the progressive rock band, see Van der Graaf Generator. A Van de Graaff generator is an electrostatic generator which uses a moving belt to accumulate electric charge on a hollow metal globe on the top of an insulated column, creating very high electric potentials. It produces very high voltage direct current (DC) electricity at low current levels. It was invented by American physicist Robert J. Van de Graaff in 1929. The potential difference achieved by modern Van de Graaff generators can be as much as 5 megavolts. A tabletop version can produce on the order of 100,000 volts and can store enough energy to produce a visible spark. Small Van de Graaff machines are produced for entertainment, and for physics education to teach electrostatics; larger ones are displayed in some science museums. The Van de Graaff generator was developed as a particle accelerator for physics research; its high potential is used to accelerate subatomic particles to great speeds in an evacuated tube. It was the most powerful type of accelerator of the 1930s until the cyclotron was developed. Van de Graaff generators are still used as accelerators to generate energetic particle and X-ray beams for nuclear research and nuclear medicine. Particle-beam Van de Graaff accelerators are often used in a "tandem" configuration: first, negatively charged ions are injected at one end towards the high potential terminal, where they are accelerated by attractive force towards the terminal. When the particles reach the terminal, they are stripped of some electrons to make them positively charged and are subsequently accelerated by repulsive forces away from the terminal. This configuration results in two accelerations for the cost of one Van de Graaff generator, and has the added advantage of leaving the complicated ion source instrumentation accessible near ground potential. The voltage produced by an open-air Van de Graaff machine is limited by arcing and corona discharge to about 5 megavolts. Most modern industrial machines are enclosed in a pressurized tank of insulating gas; these can achieve potentials of as much as about 25 megavolts. A simple Van de Graaff generator consists of a belt of rubber (or a similar flexible dielectric material) moving over two rollers of differing material, one of which is surrounded by a hollow metal sphere. Two electrodes, (2) and (7), in the form of comb-shaped rows of sharp metal points, are positioned near the bottom of the lower roller and inside the sphere, over the upper roller. Comb (2) is connected to the sphere, and comb (7) to ground. The method of charging is based on the triboelectric effect, such that simple contact of dissimilar materials causes the transfer of some electrons from one material to the other. For example (see the diagram), the rubber of the belt will become negatively charged while the acrylic glass of the upper roller will become positively charged. The belt carries away negative charge on its inner surface while the upper roller accumulates positive charge. Next, the strong electric field surrounding the positive upper roller (3) induces a very high electric field near the points of the nearby comb (2). At the points, the field becomes strong enough to ionize air molecules, and the electrons are attracted to the outside of the belt while positive ions go to the comb. At the comb (2) they are neutralized by electrons that were on the comb, thus leaving the comb and the attached outer shell (1) with fewer net electrons. By the principle illustrated in the Faraday ice pail experiment, i.e. by Gauss's law, the excess positive charge is accumulated on the outer surface of the outer shell (1), leaving no field inside the shell. Electrostatic induction by this method continues, building up very large amounts of charge on the shell. In the example, the lower roller (6) is metal, which picks negative charge off the inner surface of the belt. The lower comb (7) develops a high electric field at its points that also becomes large enough to ionize air molecules. In this case, the electrons are attracted to the comb and positive air ions neutralize negative charge on the outer surface of the belt, or become attached to the belt. The exact balance of charges on the up-going versus down-going sides of the belt will depend on the combination of the materials used. In the example, the upward-moving belt must be more positive than the downward-moving belt. As the belt continues to move, a constant "charging current" travels via the belt, and the sphere continues to accumulate positive charge until the rate that charge is being lost (through leakage and corona discharges) equals the charging current. The larger the sphere and the farther it is from ground, the higher will be its peak potential. In the example, the wand with metal sphere (8) is connected to ground, as is the lower comb (7); electrons are drawn up from ground due to the attraction by the positive sphere, and when the electric field is great enough (see below) the air breaks in the form of an electrical discharge spark (9). Since the material of the belt and rollers can be selected, the accumulated charge on the hollow metal sphere can either be made positive (electron deficient) or negative (excess electrons). The friction type of generator described above is easier to build for science fair or homemade projects, since it does not require a high-voltage source. Greater potentials can be obtained with alternative designs (not discussed here) for which high-voltage sources are used at the upper and/or lower positions of the belt to transfer charge more efficiently onto and off the belt. A Van de Graaff generator terminal does not need to be sphere-shaped to work, and in fact, the optimum shape is a sphere with an inward curve around the hole where the belt enters. A rounded terminal minimizes the electric field around it, allowing greater potentials to be achieved without ionization of the air, or other dielectric gas, surrounding. Outside the sphere, the electric field becomes very strong and applying charges directly from the outside would soon be prevented by the field. Since electrically charged conductors do not have any electric field inside, charges can be added continuously from the inside without increasing them to the full potential of the outer shell. Since a Van de Graaff generator can supply the same small current at almost any level of electrical potential, it is an example of a nearly ideal current source. The maximal achievable potential is roughly equal to the sphere radius R multiplied by the electric field Emax at which corona discharges begin to form within the surrounding gas. For air at standard temperature and pressure (STP) the breakdown field is about 30 kV/cm. Therefore, a polished spherical electrode 30 cm in diameter could be expected to develop a maximal voltage Vmax = R·Emax of about 450 kV. This explains why Van de Graaff generators are often made with the largest possible diameter. 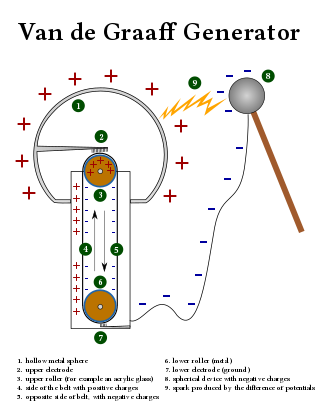 The concept of an electrostatic generator in which charge is mechanically transported in small amounts into the interior of a high-voltage electrode originated with the Kelvin water dropper, invented during 1867 by William Thomson (Lord Kelvin), in which charged drops of water fall into a bucket with the same polarity charge, adding to the charge. In a machine of this type, the gravitational force moves the drops against the opposing electrostatic field of the bucket. Kelvin himself first suggested using a belt to carry the charge instead of water. The first electrostatic machine that used an endless belt to transport charge was constructed during 1872 by Augusto Righi. It used an india rubber belt with wire rings along its length as charge carriers, which passed into a spherical metal electrode. The charge was applied to the belt from the grounded lower roller by electrostatic induction using a charged plate. John Gray also invented a belt machine about 1890. Another more complicated belt machine was invented during 1903 by Juan Burboa A more immediate inspiration for Van de Graaff was a generator W. F. G. Swann was developing during the 1920s in which charge was transported to an electrode by falling metal balls, thus returning to the principle of the Kelvin water dropper. The reason that the charge extracted from the belt moves to the outside of the sphere electrode, though it already has a high charge of the same polarity, is explained by the Faraday ice pail experiment. The Van de Graaff generator was developed, starting 1929, by physicist Robert J. Van de Graaff at Princeton University with a fellowship, with help from colleague Nicholas Burke. The first model was demonstrated during October 1929. The first machine used an ordinary tin can, a small motor, and a silk ribbon bought at a five-and-dime store. After that, he went to the chairman of the physics department requesting $100 to make an improved version. He did get the money, with some difficulty. By 1931, he could report achieving 1.5 million volts, saying "The machine is simple, inexpensive, and portable. An ordinary lamp socket provides the only power needed." According to a patent application, it had two 60-cm-diameter charge-accumulation spheres mounted on borosilicate glass columns 180 cm high; the apparatus cost only $90 during 1931. Van de Graaff applied for a second patent during December 1931, which was assigned to Massachusetts Institute of Technology in exchange for a share of net income. The patent was later granted. During 1933, Van de Graaff built a 40-ft (12-m) model at MIT's Round Hill facility, the use of which was donated by Colonel Edward H. R. Green. During 1937, the Westinghouse Electric company built a 65 feet (20 m) machine, the Westinghouse Atom Smasher capable of generating 5 MeV in Forest Hills, Pennsylvania. It marked the beginning of nuclear research for civilian applications. It was decommissioned in 1958 and was demolished in 2015. By the 1970s, as much as 14 million volts could be achieved at the terminal of a tandem that used a tank of high-pressure sulfur hexafluoride (SF6) gas to prevent sparking by trapping electrons. This allowed the generation of heavy ion beams of several tens of megaelectronvolts, sufficient to study light ion direct nuclear reactions. The greatest potential sustained by a Van de Graaff accelerator is 25.5 MV, achieved by the tandem in the Holifield Radioactive Ion Beam Facility in Oak Ridge National Laboratory. A further development is the pelletron, where the rubber or fabric belt is replaced by a chain of short conductive rods connected by insulating links, and the air-ionizing electrodes are replaced by a grounded roller and inductive charging electrode. The chain can be operated at much greater velocity than a belt, and both the voltage and currents attainable are much greater than with a conventional Van de Graaff generator. The 14 UD Heavy Ion Accelerator at the Australian National University houses a 15-million-volt pelletron. Its chains are more than 20 meters long and can travel faster than 50 kilometres per hour (31 mph). The Nuclear Structure Facility (NSF) at Daresbury Laboratory was proposed during the 1970s, commissioned during 1981, and opened for experiments during 1983. It consisted of a tandem Van de Graaff generator operating routinely at 20 MV, housed in a distinctive building 70 m high. During its lifetime, it accelerated 80 different ion beams for experimental use, ranging from protons to uranium. A particular feature was the ability to accelerate rare isotopic and radioactive beams. Perhaps the most important discovery made using the NSF was that of super-deformed nuclei. These nuclei, when formed from the fusion of lighter elements, rotate very rapidly. The pattern of gamma rays emitted as they slow down provided detailed information about the inner structure of the nucleus. Following financial cutbacks, the NSF closed in 1993. An educational program at the Theater of Electricity, Boston Museum of Science demonstrates the world's largest air-insulated Van de Graaff generator, built by Van de Graaff in the 1930s. The largest air-insulated Van de Graaff generator in the world, built by Dr. Van de Graaff during the 1930s, is now displayed permanently at Boston's Museum of Science. With two conjoined 4.5 m (15 ft) aluminium spheres standing on columns 22 ft (6.7 m) tall, this generator can often obtain 2 MV (2 million volts). Shows using the Van de Graaff generator and several Tesla coils are conducted two to three times a day. Many science museums, such as the American Museum of Science and Energy, have small-scale Van de Graaff generators on display, and exploit their static-producing qualities to create "lightning" or make people's hair stand up. Van de Graaff generators are also used in schools and science shows. Other electrostatic machines like the Wimshurst machine or Bonetti machine work similarly to the Van De Graaff; charge is transported by moving plates, disks, or cylinders to a high voltage electrode. For these generators, however, corona discharge from exposed metal parts at high potentials and poorer insulation result in smaller voltages. In an electrostatic generator, the rate of charge transported (current) to the high-voltage electrode is very small. After the machine is started, the voltage on the terminal electrode increases until the leakage current from the electrode equals the rate of charge transport. Therefore, leakage from the terminal determines the maximum voltage attainable. In the Van de Graaff generator, the belt allows the transport of charge into the interior of a large hollow spherical electrode. This is the ideal shape to minimize leakage and corona discharge, so the Van de Graaff generator can produce the greatest voltage. This is why the Van de Graaff design has been used for all electrostatic particle accelerators. In general, the larger the diameter and the smoother the sphere is, the higher the voltage that can be achieved. U.S. Patent 1,991,236 — "Electrostatic Generator"
U.S. Patent 2,922,905 — "Apparatus For Reducing Electron Loading In Positive-Ion Accelerators"
^ a b c d Van de Graaff, R. J.; Compton, K. T.; Van Atta, L. C. (February 1933). "The Electrostatic Production of High Voltage for Nuclear Investigations" (PDF). Physical Review. 43 (3): 149–157. Bibcode:1933PhRv...43..149V. doi:10.1103/PhysRev.43.149. Retrieved August 31, 2015. ^ Zavisa, John M. "How Van de Graaff Generators Work". HowStuffWorks. Retrieved 2007-12-28. ^ Thomson, William (November 1867). "On a self-acting apparatus for multiplying and maintaining electric charges, with applications to the Voltaic Theory". The London, Edinburgh, and Dublin Philosophical Magazine and Journal of Science. Series 4. 34 (231): 391–396. Retrieved September 1, 2015. ^ a b c Gray, John (1890). Electrical Influence Machines. London: Whittaker and Co. pp. 187–190. ^ Swann, W. F. G. (1928). "A device for obtaining high potentials". Journal of the Franklin Institute. 205: 828. ^ Young, Hugh D.; Freedman, Roger A. (2012). University Physics, 13th Ed. Pearson Education, Inc. pp. 742–743. ISBN 978-0321696861. ^ "The Institute of Chemistry - The Hebrew University of Jerusalem". ^ Toker, Franklin (2009). Pittsburgh: A New Portrait. p. 470. ISBN 9780822943716. ^ "Van de Graaff particle accelerator, Westinghouse Electric and Manufacturing Co., Pittsburgh, PA, August 7, 1945". Explore PA History. WITF-TV. Retrieved February 19, 2015. ^ O'Neill, Brian (January 25, 2015). "Brian O'Neill: With Forest Hills atom smasher's fall, part of history tumbles". Pittsburgh Post-Gazette. ^ "American Physical Society names ORNL's Holifield Facility historic physics site". Oak Ridge National Laboratory. ^ "The Bonetti electrostatic machine". www.coe.ufrj.br. Retrieved 2010-09-14. Wikimedia Commons has media related to Van de Graaff generators. This page was last edited on 13 March 2019, at 03:23 (UTC).